After having some major success with black garlic a few weeks ago, I wanted to keep teasing out new possibilities and flavors with an ingredient I unfortunately overlooked for a few years. 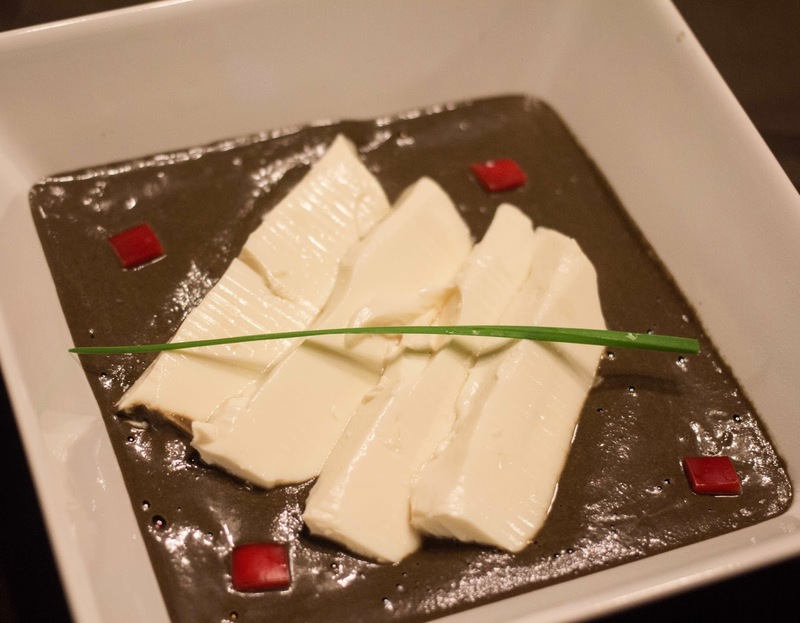 For me, the success came by pairing black garlic with a rich, fatty sauce of cheese and cream. The fat locked in the intensely savory, earthy, and surprisingly sweet flavor of black garlic. Plus, being in a sauce, the unique flavor of the black garlic was evenly distributed throughout the dish (a black garlic mac and cheese in this case). Originally black garlic was created in Korea, so I wanted to try a less Western dish than Mac n' Cheese, but keep the idea of using a rich sauce to carry the black garlic's beguiling flavor. 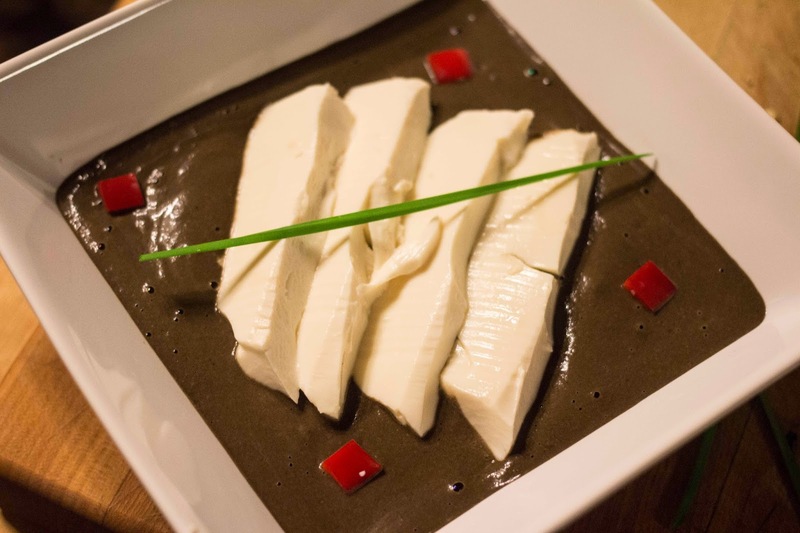 Asia does not have a long-history of cheese making like the West, aside from Tibetan Yak cheese, but they do have something very similar: tofu. Like milk being set with rennet to curds in cheese making, tofu starts when soy milk is set with an acidic ingredient like citrus juice to form a soft, wobbly curd. Then the curds are collected and allowed to drain in a colander or mold. At this point the tofu can be enjoyed young and fresh, or pressed and drained for a firmer, drier product. Although not a fatty item at all, I thought the tofu would be a great jumping off point for this dish. Silken tofu is soft and slightly bland, making it a wonderful vehicle for delivering big flavors. To make a richer sauce, I decided to go about making a vegan cream sauce, which is something I've learned while cooking at the Nittany Lion Inn. 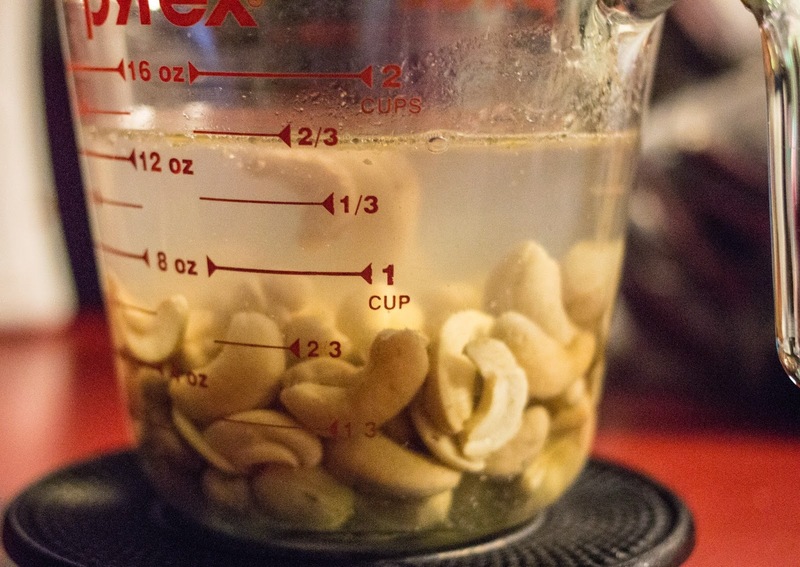 I soaked cashews in water for about four hours until they took on a soft, slightly crumbly texture. The cashews were drained, and then pureed until a smooth, thick paste formed. This paste is surprising adept at thickening all kinds of soups and sauces. I added the cloves of two heads of black garlic, along with some salt, red pepper, and some almond milk to thin out the sauce a bit. As this whirled in the blender, it took on a creamy, spoonable texture. But the color became a anemic gray and looks pretty awful. So I deviated from the vegan route and added a packet of squid ink (4 grams worth) and that got me to a much nicer color. It wasn't jet-black like I wanted, but it still really set off the pure whiteness of the tofu. Taste-wise, I really like this. I love the flavor of the sauce and think the cashew and almond milk is also a good way to capture that black garlic flavor. Texture-wise, the dish was fine, but suffered from rapidly diminishing returns. At first it was great, with the thick, intense sauce and smooth, creamy tofu, like a savory black garlic custard. But about half way through the dish both Carla and I had our fill of all of wobbly, creamy spoonfuls. Carla remarked that this would be wonderful as a starter, but needed some more textural contrast to really stand out as a main dish. While making this, I realized it was similar to a dish I had at Morimoto's; a bowl of creamy congee rice porridge with a generous square of braised pork belly right in the center. In that preparation, the creamy congee paired wonderfully with the rich, fatty pork belly, while still having the shreds of meat running through the belly to add some textural change. Perhaps I should try that? I guess if I do, I don't need to sweat so much over adding squid ink to my vegan sauce.